Photo by Flickr user RomanK Photography. CC BY-NC-ND 2.0. Those are the lyrics of the famous song “Take the A Train,” recorded by Ella Fitzgerald and composed by jazz legend Duke Ellington. This is just one of the many examples of inspiration awakened by the Big Apple's subway system, which extends 1,353 kilometers and one of the most extensive underground networks in the United States and in the world. From urban myths like crocodiles in the sewers to loves lost in the sea of commuters, the subway proves to be more than a means of transport; it's almost a way of life. Among its 5 million daily users are Wall Street executives, homeless people seeking refuge for the night, and aspiring artists, from hip hop dancers to singers performing Mexican pop music. The cultural bonanza is not only evident in the train cars; there are close to 200 permanent works of art to be found on the walls and floors of the subway stations, all of which are sponsored by the Metropolitan Transportation Authority [MTA] program “Arts for Transit.” Among other missions, this program protects musicians of a variety of genres – from opera to East Asian music – who perform for the millions of commuters frantically running to transfer from one train to another. But the New York subway system does not always receive praise. Beneath the city's surface are billions of rats that proliferate around the train rails. Recently, a city transit union organized an “Ugliest Rat” contest. The competition called on straphangers to submit a photo of the “most disgusting” rat they could find on their commute. The goal of this contest was to raise consciousness about the working conditions of many MTA employees. Workers have encountered rats in the staff rooms, offices, and dining halls, all located underground. Although the contest took place in 2012, it is difficult to maintain control over the vermin, which have even gotten into subway cars full of passengers. Passengers are also taking matters into their own hands when it comes to evaluating subway service. 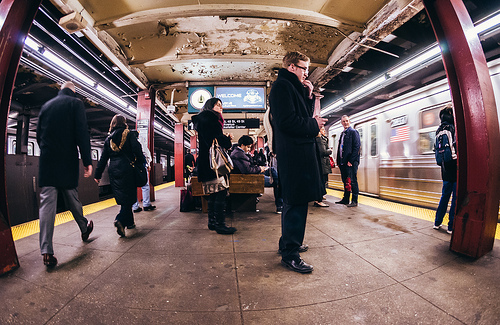 For the past 15 years, the New York City Straphangers Campaign has compiled a “report card” based on a series of factors including on time performance, cleanliness, mechanical breakdowns, chances of getting a seat, and frequency of announcements. In the most recent report card, the Q train got the best scores, while the C train was rated the worst subway line. Was hoping not to spend my entire Saturday at Myrtle-Willoughby waiting for the G train but I guess the #MTA has other things in mind. 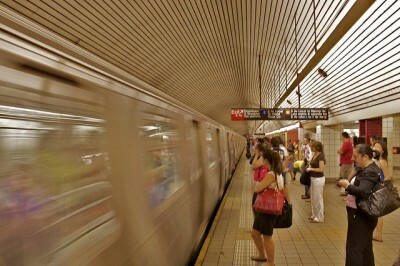 Love it or hate it, the New York City subway system is indespensable for many of the city's millions of residents. And there will always be some who want to strengthen this relationship. For example, this video shows a group of people who wanted to surprise train conductors, who are required to point at a black-and-white striped board as a signal that they are safely stopped at the correct spot on the subway platform. Love the video of the rat on a train.